Dementia is a great challenge facing the world population. “The World Alzheimer Report 2015” stated that there are currently 46.8 million people living with dementia around the world and 49% of them reside in Asia. The number is projected to increase to 131.5 million in 2050. As with all diseases and conditions, early screening for dementia is a crucial first step towards applying timely subsequent interventions to minimize disruptions and delay the impact of cognitive decline for as long as possible. The Mini Mental State Examination (“MMSE”) has been the most widely used tool for assessing global cognitive ability in many countries since it was developed in 1975. However, the creators have patented the Examination and this has led to copyright issues with its use and thus limiting the routine but hugely important application of assessing cognitive function of older people worldwide. 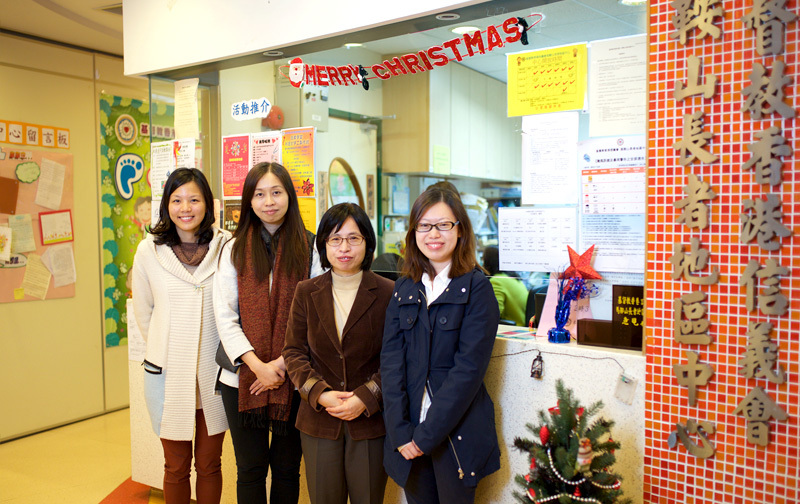 Prof. Helen Chiu with research assistant and centre staff in the elderly centre where research is conducted. In view of the copyright issue and together with some identified limitations of MMSE, Emeritus Professor Helen Chiu of the Department of Psychiatry, The Chinese University of Hong Kong, with the Foundation’s support, has developed the Hong Kong Brief Cognitive Test (“HKBC”) for the assessment of cognitive impairment specifically for the Chinese population. Before that, there was no cognitive test catered to cultural and educational differences of the Chinese population and there is a strong need to address this. Professor Chiu has no plans of patenting the HKBC so as to allow medical practitioners and other frontline service providers to use them as the standard screening and evaluation tool. Research results have since been published in the International Journal of Geriatric Psychiatry, and presented at the 2018 Annual Meeting of the American Association of Geriatric Psychiatry. We expect the test to also be adopted by practitioners outside Hong Kong, bringing benefits to Chinese older people in mainland China, Taiwan and other countries. The HKBC is currently available for free download online and can be accessed here: http://www.psychiatry.cuhk.edu.hk/HKBC.